Why The Beatles' Yellow Submarine is a trippy cult classic . Beatles Radio: The Beatles, Solos, Covers, Birthdays, News The Fab 4 and More! 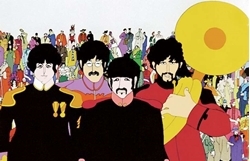 In 1968, The Beatles got in a yellow submarine and sailed away to the sea of green – on screen at least – in an animated caper designed to fulfil their three-picture contract for United Artists, without much effort on their part. It could have sunk without a trace, a cinematic curio of the flower power age. Yet Yellow Submarine has become an enduring cult classic. The yellow sub can be found on all sorts of merchandise, from socks and tea infusers to Lego sets and Monopoly boards. Rumour has it, it’s even one of the Queen’s favourite films. It may boast almost absurdly of-its-era psychedelic visuals and a tripped-out narrative, but its appeal isn’t as the stoner’s background movie of choice: Yellow Submarine has also become a children's favourite. “That film works for every generation,” George Harrison himself decreed.